During my tenure as the provenance researcher at the Cleveland Museum of Art (CMA), I worked on the provenances of a few paintings that had particularly complex and/or elusive ownership histories. I researched these provenances fairly continuously over the course of my nearly 3.5 years there, variously following promising leads and hitting dead-ends, hoping to solve the mysteries of their pasts. While l wasn’t able to fill in all of the gaps in these paintings’ provenances, I did make significant progress on all of them and uncover at least some elements of their fascinating histories. One of these paintings was Thomas Cole’s Hudson River School masterpiece, View of Florence (http://www.clevelandart.org/art/1961.39 ), painted in 1837. Researching this provenance, with its many twists and turns, was definitely a labor of love, as I dubbed it my mission in life to close the nearly 100-year gap in its provenance. Read on for the story of its provenance, and my provenance research. By 1848 – before 1854 Edward James, New York, NY, probably to Henry James, Sr.
Jonathan Mason, Cole’s friend and agent, wrote to the artist on March 20, 1838 and indicated that the painting was sold to a “Mr. Hunt” by Mason, on behalf of Cole in 1838. Further details about Hunt’s identity are unknown. Mason is listed as the painting’s owner in an 1839 exhibition at the Boston Athenaeum (exhibition catalogues and other records of exhibitions are a great way to trace provenance, as often the lender of the object to an exhibition is documented). An 1848 exhibition of works by Cole held at the American Art Union lists Edward James as the lender of the painting. Edward James, the uncle of novelist Henry James, is among the lesser known members of the prominent James family. Henry James, Sr., father of novelist Henry James, owned the painting by 1854, when he was listed as its owner in a New York Gallery of Fine Arts exhibition on May 1st of that year. We have some additional – and interesting – documentation for this painting’s having been with the James family: in his memoir of 1913, A Small Boy and Others, novelist Henry James recalls the painting, which “covered half a side of our front parlor” of the family’s brownstone on West 14th Street in Manhattan. He writes that, as of 1913, the painting was “long ago lost to our sight,” which suggests that the painting had not been with the family for quite some time at that point. And indeed, it seemed that all traces of the painting were lost until art dealer Victor Spark acquired it and sold it to CMA in 1961. 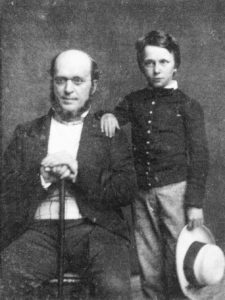 Henry James, Sr. and Henry James, Jr. 1854 Daguerreotype, Mathew Brady. The first issue that needed to be tackled in working out this provenance was the sometime inclusion (such as in Diana Strazdes’ entry on this painting in the 1983 exhibition catalogue, A Lost World: Masterpieces of American Painting, 1760-1910) of Thomas Parkman Cushing in the provenance following Edward James and prior to Henry James, Sr. The presence of Cushing raised the question of how/why the painting would have been in the possession of a member of the James family, then owned by someone else, and then, once again, with a member of the James family. 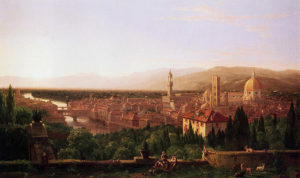 Cushing lent a painting titled View on the Arno, near Florence to an exhibition at the Boston Athenaeum in 1850. However, my research revealed that Strazdes had likely confused the Cleveland picture with a different Cole painting, currently in the Worcester Art Museum (1991.179), assigning the Cushing provenance to the wrong painting. The second – and more significant – problem at hand was, of course, the massive century-long gap in the painting’s provenance, from 1854 until 1961. I worked on closing this gap from both ends: Under what circumstances did it leave James’ possession, and when/from whom did Spark acquire it? Let’s start with Spark’s acquisition of the painting. Victor Spark, a New York dealer specializing in Old Master paintings and 19th/early 20th-century art, sold the painting to CMA in 1960. A search of his records at the Archives of American Art (now available digitally) revealed that Spark had purchased the painting in 1960 from Francis Moro, who operated a paintings conservation studio in New York City with his brother, Tom. Francis also worked as an art dealer, opening Moro Galleries, Inc. in 1966. However, without knowing the circumstances of Moro’s acquisition of the painting, this discovery didn’t do much to close the 100-year gap still remaining in the provenance. But coincidentally, a CMA curator knew the nephew of Francis Moro, who was familiar with a bit of the story of his uncle’s acquisition of the painting. Moro bought the painting from a private collector who had seen the painting displayed in the window of a New York City antique store, where he had purchased it. The identities of both this collector and of the antique store appear to be lost to history. And of course, we still don’t know when these transactions took place: was the Cole in an antique store in the 1950s, or in the 1890s? Sadly, we just don’t – and possibly, can’t – know. And so I entered this new information into the provenance, but without specific names and dates. Armed with these newly discovered details that, while interesting, provided little concrete provenance, I then tried to close the gap, working from 1854 onward. Because works by Cole and those belonging to the Hudson River School in general were not held in particularly high esteem at this time, it is quite possible, suggests Alfred Habegger, a noted Henry James scholar, that the painting was simply left on the walls of the 14th Street house when the family went to Europe, and was eventually sold along with the house to Greene. If the painting did indeed remain with Greene while he lived on 14th Street, where did it go afterwards? Let’s assume that the Cole painting continued to be thought of as having little value: perhaps it remained, again, in the home when the next occupant moved in? According to contemporary New York City directories, one Mary Harkin lived in the house after Greene moved out. Habegger recalled that Greene had some connection to the fashion industry, and therefore may have “gifted” the Cole to Harkin, who is listed in the city directory as a seamstress, and whom Greene may have known. Alternatively, perhaps the painting was passed down through Greene’s family. In hopes of verifying this possibility, I combed through the wills of three generations of Greene family members, only to come up empty. Most of the wills I consulted made no mention of artwork, and the one that did mention paintings, did not refer to any by name. And so, the gap remains unclosed, my mission unfulfilled. But because the painting ultimately made its way to a New York City antique shop, and because it was also in New York City in the mid-1850s, it is quite possible that the painting never left the city, remaining in the James home, passing down through the Greene family – or perhaps the Harkin family – or following some other path into the twentieth century. We do know that as of 1913, the painting was “long ago lost” to the James’ “sight,” and so, it is certainly conceivable that when the family moved to Europe in 1855, that was also the last time they saw their Cole. In any case, I was able to update this painting’s provenance with some additional, if vague, information. I included none of the Greene/Harkin material in the painting’s “official” provenance because, without documentation, it is, at this point, only conjecture. For more information about this provenance, see http://www.clevelandart.org/art/1961.39.